As I mentioned in a previous blog (https://blog.lesterpickerphoto.com/2010/11/28/te-anau-new-zealand/), Te Anau is a wonderful small town situated on the shores of Lake Te Anau. It is blessed to sit on the eastern side of the mountain chain that affords it protection from the winds and storms that blow in from the Tasmanian Sea. 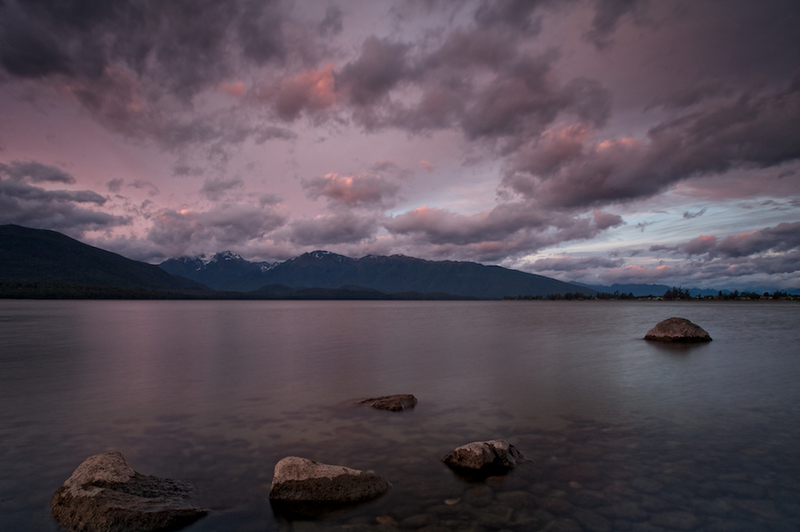 It’s hard for me to absorb the following statistics: rainfall in the foothills on the southeast side of Lake Manapouri, just east of the mountain range averages about 1 meter (39 inches) a year. That’s a reasonable amount of rain, comparable to the 40 inches of rain that falls in my home state of Maryland. But on the northwest shore of Lake Manapouri, where our boat just dropped us off, rainfall averages three meters a year (117 inches)! Now our rickety bus is taking us along a narrow, winding gravel road that climbs those mountains- the only road available- and after 30 minutes our small group find itself on the shores of Doubtful Sound, so named by Captain Cook in 1770 because of its forbidding navigation. Without exaggeration, it is one of the most spectacular places I have ever been, with its deep fiords and towering peaks. It looks every bit like the rain forest that it is, but it takes an average of seven to nine meters of rain a year to maintain that botanical diversity! That’s meters, as in 39 inches to a meter, or 275-350 inches of rain falling on average for 225 days a year. That is a whole lot of rain! And, man, are we in the midst of it! Te Anau is the launching point for trips to nearby Milford and Doubtful Sounds. These trips can be one-day affairs or multi-day excursions. The Doubtful Sound excursion involves taking a bus from Te Anau to Manapouri, then a 45-minute boat ride across the lake and then another bus up and over the mountains, before dropping steeply to Doubtful Sound and the boat you will call home for a few hours, or possibly two or more days. Companies like Real Journeys (www.realjourneys.co.nz) and Fiordland Cruises (http://www.doubtfulsound.com/) offer these not-to-be-missed packages (there are other outfitters, too). In Te Anau, Real Journeys is the heavyweight adventure outfitter, with a wider selection of activities and larger boats, while Fiordland and its cousins offer smaller boats and more intimate experiences. I chose Real Journeys for two of my three Sound experiences; a one-day cruise on Milford Sound and a half-day trip to the Glowworm Caves. Milford Sound receives the lion’s share of the attention when visitors consider cruising on a fiord. But, in my opinion, Doubtful Sound is far more spectacular, although less predictable weather-wise. On our two-day Doubtful Sound cruise, we enjoyed the area’s reputation for liquid sunshine to the tune of non-stop rain, day and night without letup. Still one cannot help but be awed by the natural splendor of these fiords. 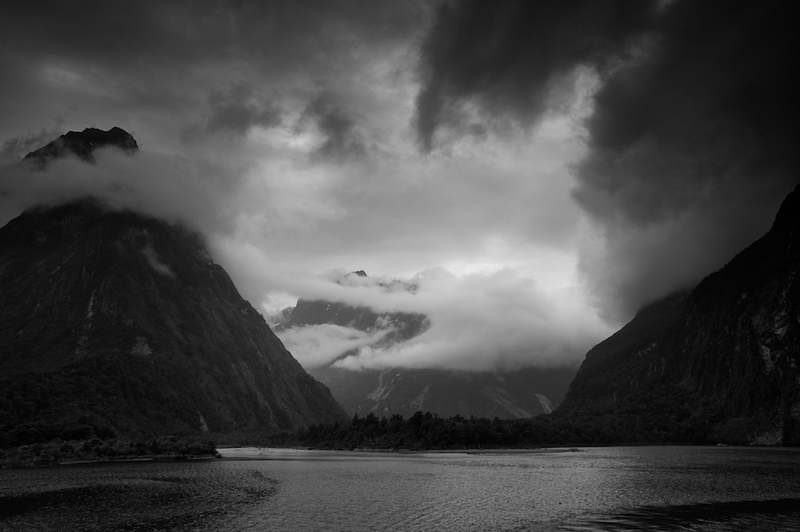 Our one-day Milford Sound excursion was no different, with rain seriously curtailing my photography. It’s one thing to photograph in the rain, it’s another to do so on a moving, pitching and yawing small boat with the wind blowing. Frustrating, yes, but the purpose of the trip was more to scout out locations for our intended 3-month return visit in 2012-2013. This time I’ll plan to visit closer to summer. BTW, I’ll also be offering some exciting photography workshops at that time, so contact me to be placed on my list if you are interested. One of the highlights of our stay in Te Anau, was our half-day visit to the Glowworm caves on the north shore of Lake Te Anau. A 30-minute Real Journeys boat trip took us to a docking facility for the caves. We sat through a short video presentation and then were escorted as part of a small group into the cave itself. Cave is a bit of a misnomer in this case. The Glowworm cave is part of a labyrinthine system of caves, some four miles long and cascading through four levels. Visitors may only access the Glowworm caves, located at the lower end of what is known as the Aurora Caves, and at another site on the upper end. As a former biologist I was absolutely captivated by this cave and the way in which it has been packaged, with respect for the fragile environment. We entered as part of a 14-person group. The cave system is huge, with a raging river thundering through it. Catwalks allow visitors to walk through, every bend and turn more fascinating then the last. At one point you come to a waterfall roaring down a wall and into a pool. And then, you come to the glowworms. My biological curiosity was peaked by these amazing creatures that are actually the larval stage of a fly. They create long mucous tubes within which thy crawl so they are not desiccated. From these tubes they suspend sticky mucous strings with title droplets that look like jewels. They then turn on a tiny bioluminescent light located near its tail, which attracts insects that the larvae use as food. At one point in the cave all 14 people silently board a boat that is hand-pulled to the middle of a grotto. It is pitch dark and suddenly you look up and see a constellation of glowworm ‘stars’ that has everyone gasping. Everyone, that is, except for the insensitive moron sitting behind me who whispered to his young son: “Hey, this is what they’re making such a big deal about?” I guess he was hoping for “It’s a Small World After All” and a fireworks display. Go figure.